As it is,information is aN important commodity in this era of unprecendented technological advances. And it has become a necessity to provide people the opportunity to keep intouch whenever they want and wherever they are. This has driven major companies to link up with highly competent internet service providers, therefore Mc DONALd's Italy has recently partnered with British Telecoms in order to convert all Mc Donald's outlets into a WI-FI area. It is especially beneficial for businesspeople who usually don't have much time to deal with all the important tasks relative to their work,for example while I'm dong this at the Rome Central Terminal station,I can overhear (eavesdropping?) 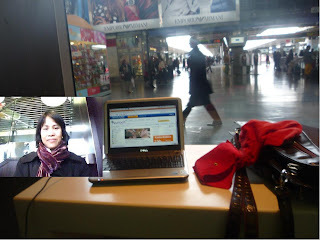 a young man in business attire involved in a business conversation with somebody in Milan, while he' apparently on his way there,his laptop, open on this same counter. What's good is that the internet connection provided by British Telecoms is fast, free and satisfactory.